I snapped this photo last Thursday; it shows Gina paddling north and about .5nm seaward of Cape Banks. The forecast was for 15 to 20 SE . Records for the local weather station at Little Bay indicated 19 to 27 for most of the time we were on the water but at sea level 20 knots seemed about right. 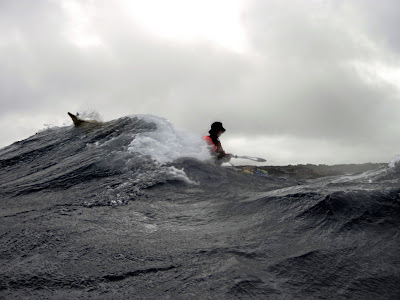 Paddling from La Perouse into the breeze was pretty heavy going but the ebbing tide assisted our outward progress until it collided with the onshore wind. After we turned north, wave reflection and these opposing forces of wind and tide provided a fast bumpy ride up the coast. Low cloud and misty rain completed a dramatic picture. There were no real surprises; if you look at a chart of the area you will see that aspect and topography make Cape Banks a magnet for current, sea and swell. Even around Sydney self sufficiency is pretty important, although it is still the holiday season, the cooler weather and light rain kept everyone inside and we saw no other boats beyond the Bay.